Complete trailer wheel and tyre assembly with a silver wheel rim. Please Note – The above images as well as any dimensions drawings in this advert are for illustration purposes only. Rim style as well as tread style may vary in appearance depending on supplier. 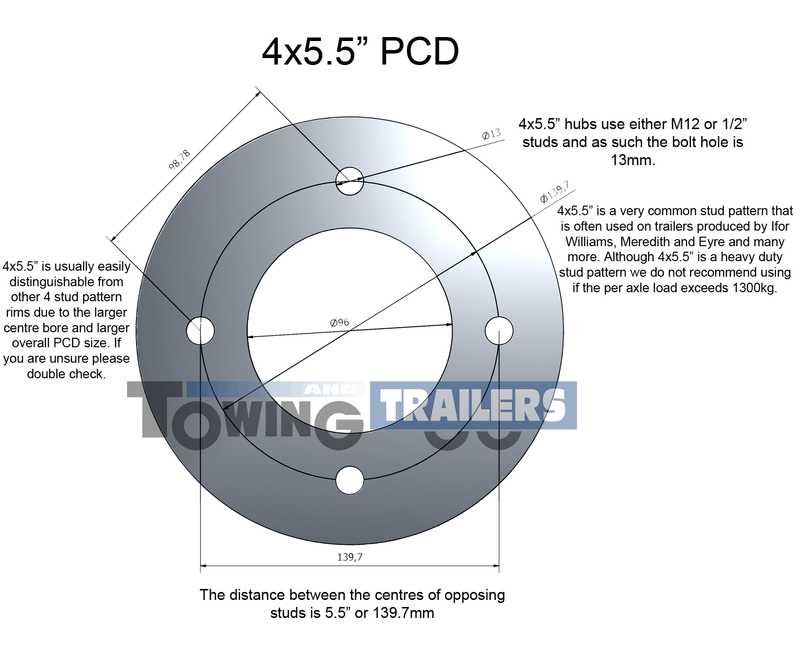 If you require the full specification of this trailer wheel, then please scroll to the table at the bottom of the page. There is also drawing which illustrates how the 4 x 5.5″” PCD is measured under the specifications table. This is a Radial Wheel. Radial wheels tend to have more flexible side walls and therefore a more stable contact with the road service they are travelling on. With a carrying capacity of 670kg, this wheel is ideal for single axle trailers up to 1300kg as well as twin axle trailers and Horsebox Trailers. Also suitable for use on Ifor Williams HB506 2600kg Horse Box trailer. We keep a large range of 13″ trailer wheel and tyre assemblies with 4 stud 5.5″ PCD. Click here, or alternatively, please call 01909 473749.